He just couldn’t take it anymore. A video has just surfaced that shows how sad and dangerous forcing wild animals to perform in circuses can be. The footage, shot during a Circus on Ice show in Bila Tserkva, Ukraine, shows a large bear lying on his back on the ground before his trainer. Dozens of spectators are just a few feet away. And it only takes a second for things to go terribly wrong. It appears that the bear is following his trainer’s orders when he is lying down, but suddenly he lunges up and breaks away from his trainer, jumping toward the crowd. Children’s screams can be heard immediately, and the footage cuts away as chaos takes hold of the audience. A few seconds later, the bear jumps back onto the stage and sprints across to the other side, and the footage cuts away again, as the spectator filming the video starts running away with the crowd, out of the arena and into the open air outside. The screen goes dark, but the screams and cries of a child can still be heard for another minute. According to reports, several people were injured — it's not yet clear whether the bear attacked anyone or whether people were hurt fleeing the circus tent. “The frightening incident captured on video that showed a bear lunging towards the audience at a Ukraine circus is a reminder that bears, elephants, tigers and other captive wildlife abused by circuses are powerful and unpredictable animals, and their use in traveling shows puts the public at risk,” Debbie Leahy, manager of captive wildlife protection for the Humane Society of the United States (HSUS), told The Dodo. The incident occurred just days after one of the most famous and established circuses, Ringling Bros. and Barnum & Bailey Circus, performed its last show ever. 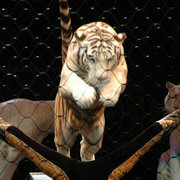 While the shuttering of Ringling Bros. appeared to be an emblem of progress for wild animals forced to perform, the last performance was tempered by news that Ringling Bros. still isn’t planning to let some of its animals retire, since it is applying for a permit to send many of its tigers to a circus in Germany. It is unclear what will happen to the bear, now that he may be considered dangerous. The circus reportedly reimbursed audience members for tickets and damaged possessions. But for the exhausted circus bear who snapped during the performance on Friday, the change just didn’t come fast enough. To stand up for animals forced to perform in circuses, you can pledge never to buy a ticket to an animal show and share this story with your friends and family. You can also speak out against circuses coming to your region, or donate to help bears rescued by Four Paws International.